I love the story of Jesus in the boat. He is sleeping on a cushion when a storm so frightens the disciples that they wake Him in fear for their lives. His words, “Peace, be still” silence the raging storm. It is a story of His power and command even over nature’s terrifying violence. I love it so much that I have a print depicting the event hanging in my home. Today I was blessed with a new look at that scene and how it applies to our lives today. Many saints have written about their struggles with a “dark night” in their lives when God seemed very distant from them; when prayer seemed dry and the human feelings of being close to God evaporated. I have gone through such a time and it is very painful; it’s a struggle to continue crying out to Him, wondering if He’s turned His face away or if you’ve done something wrong. Since that time in my life I’ve read more about the dark night and have come to understand that it is a time of testing, of teaching one to walk by faith and not by feelings. That just made me smile, seeing how she connected the passage in Mark with the dark night. 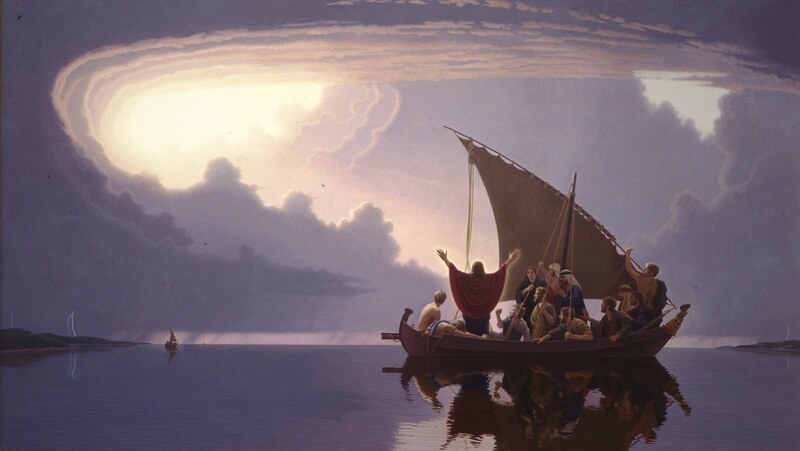 There are times in our lives when Jesus is sleeping in our little boat, or appears to be. But He most certainly is not uncaring. Have faith; in an instant He can calm the most violent storm. “A violent squall came up and waves were breaking over the boat, so that it was already filling up. Jesus was in the stern, asleep on a cushion. May I always allow the Master to sleep peacefully within. None of that is bad, nor particularly wrong. Giving is a good thing! Sharing our bounty, being generous, thoughtfulness in how we give – these are all kindness and charity and I don’t know if the world can ever have too much of that. However, if we are asking the question, “What’s it all about?” the answer is not giving, generosity, nor sharing. What it’s all about – the point of the Christmas season, the point of Jesus’ birth and death and resurrection, the point of our earthly lives – is receiving. It’s not about what we do … it’s about what He did. Do we receive Him? Do we receive the child, the Messiah? Do we receive the gift of His sacrifice? Do we receive the Holy Spirit, the Paraclete, the Comforter sent to us by Jesus after His ascension? Do we seek Him, rush to Him, welcome Him, receive Him fully into our lives in an active and daily way? Knowing about God and even believing He exists is not enough. When the Magi were in Jerusalem the Jewish priests were able to tell Herod where the Messiah would be born; we presume as priests they believed in God and gave their service to Him daily in the temple. But they did not accompany the Magi to see the Messiah for whom they had long waited – they stayed in Jerusalem! How about us? Do we believe? Do we try to do good and be good citizens and make this world a better place? Or do we receive Him … really, deeply seek and receive the Lord of Lords, the King of Kings? It’s always so cool when the Holy Spirit reveals something new as I read scripture. In a few cases He has built on something He showed me long ago; the revealing is in stages and that really “wows” me! I was reminded of one of those lessons this week when we read Matthew’s account of the genealogy of Jesus at mass … but it started long before that. During a study of Ruth, I was touched by how kind Boaz was to Ruth from the first time he met her. She noticed it too and asked him how she had come to find favor with him and he simply said he had heard of the good things she had done for Naomi. My original lesson from this was how our words can affect other peoples’ opinions. We are repeatedly cautioned in the Bible to guard our words and that they can be destructive – they can hurt or they can heal. Even one of the commandments is about bearing false witness. So the Holy Spirit helped me appreciate the unknown person who had given Boaz such a positive report and good first impression of Ruth. Think about it – Naomi left the community with her husband and sons only to return years later with a foreign woman and a story about how the men had all died. Wouldn’t THAT be the topic of hot gossip and uncharitable speculation in any community! I took that lesson to heart and thought of it once in a while when the Holy Spirit stirred it up within me again – usually when I caught myself about to gossip or say something unkind! Years later I was starting a study of Matthew and it begins with that genealogy. I was paying attention to it more than usual, trying to associate any of the familiar names with their stories in the Old Testament. We can see how God prepared him for the moment he met Ruth, how he shaped Boaz to treat her with kindness and to receive her as his wife. Perhaps as a mixed-race man, he had not been found “acceptable” as a husband to any of the Israelite women. God brought Boaz and Ruth together in a surprising way and they were blessed to be the parents of Obed, the grandparents of Jesse, and the great-grandparents of King David. Wow! All ancestors of Joseph, the husband of Mary. I have never heard a sermon tying all of this together; I have never read a commentary that notes it. I guess it’s just one of those little lessons given to me in a personal way, and I think about it when I find myself suffering a trial and wondering what it means. Sometimes we eventually see a lesson we were supposed to learn in it or can look back and see how it shaped us in a certain way. But other times I think we may never know in this life the work that God is doing within us and the ways He uses it for others, maybe even far into the future. When I am struggling, I find that very comforting. Job and Jesus … again! In this post I noted two passages in the book of Job that refer to Jesus … places where I see Jesus in the Old Testament. Today it happened again; a very short but oh-so-precious scene just filled my heart. Soon we will enter the season of Advent and that scene of the baby in the manger with an ox, a donkey and lambs surrounding Him will often be displayed. I will have a new love for that scene, now, thinking of the ox consenting to serve God and to pass the night by His manger. Wow … that is just so beautiful to ponder! Twice now I’ve seen Jesus in the book of Job. How cool is that, that Job would habitually offer sacrifices for every one of his children in case they had sinned? I pondered how I might do the same for my own children. We don’t offer sacrifices today as they did in the Old Testament. The reason is simple … the perfect sacrifice has been made: Jesus’ blood was shed for our sins and He is the lamb that was slain. And I came to realize that in a way, I could do as Job did – offering the sacrifice that Jesus already made – for the forgiveness of sins for my children. The Divine Mercy novena does just that and is a perfect prayer I can offer for my loved ones! I have been very blessed since the Holy Spirit showed me that; I love seeing Jesus in the Old Testament! How blessed we are to have an arbiter! I thank God for His wisdom and mercy in sending His son to become one of us, approachable, a friend, our brother. Who could have imagined it, or thought to ask for it?